Dentures are one of the oldest forms of dental repair that exists, with centuries of precedence showing us that the idea of retaining our ability to speak and eat with artificial teeth is not a new one. Even George Washington wore fake teeth, though his were made from teeth purchased from slaves rather than being made from wood as most of us grew up believing. These days dentures are much more sophisticated and have become more natural in appearance, more comfortable to wear, and longer lasting with modern technology. How your dentures work depends largely on what variety of dentures you have. While most of us are familiar with full dentures, used to replace a full mouth of missing teeth, there are other types used when only a partial repair is needed. Conventional Full Dentures – These dentures are typically placed in your mouth sometime after the initial removal of your teeth. Rather than being placed immediately, time is given for the tissues to heal, a process which can take several months. Partial Dentures – These dentures are in a metal framework attached to your existing teeth. Occasionally crowns are included on top of your natural teeth to serve as anchor-points for the partial denture. These are a common alternative to bridges. Dentures can last a long time if they are cared for properly, but will occasionally require maintenance. Additionally, as you age your mouth will change requiring the dentures to be refit. 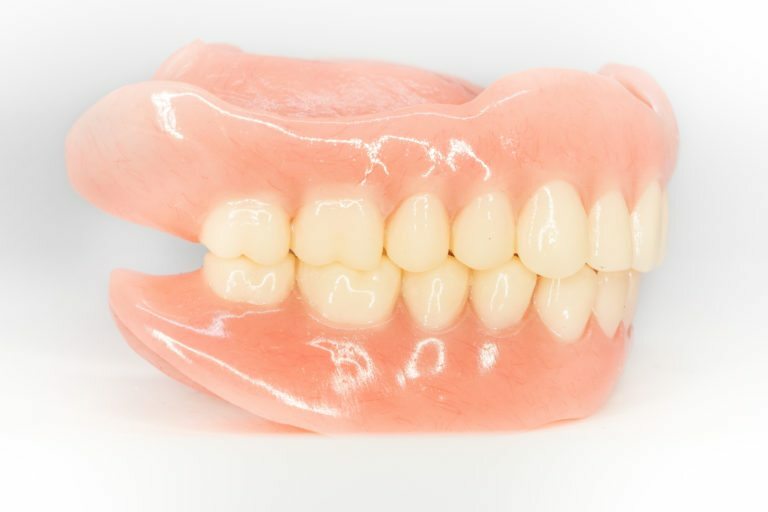 Maintenance includes rebasing, replacing the base of the dentures while keeping the teeth, relined to keep them comfortable, or completely remade in case of irreparable damage. Dentures need a lot of care to make sure they last you as long as possible and provide you with a comfortable and odor-free experience. To keep your dentures fresh and clean there are a few steps you need to take. Keep Dentures Moist – Dentures should always be either being worn, or placed in either plain water or a denture cleanser soaking solution when you’re not wearing them. However, you must avoid hot water, as this can cause warping. Regular Brushing – Just like your natural teeth, dentures need regular oral care to remain healthy and clean. Additionally, regular brushing will help prevent staining, keeping your smile beautiful. Proper Oral Care – Every morning and evening you’re going to want to do a full oral cleansing, including your palate, tongue, and gums. Clean these areas with a soft-bristled brush before you insert your dentures and after you remove them. Consult Your Dentist – Don’t attempt to adjust damaged, chipped, or broken dentures yourself, consult your dentist for any needed repairs to avoid breaking them permanently. Following these four simple steps will help extend the lifetime of your dentures, allowing you to continue to eat and communicate normally for years to come. If you think you’re a candidate for partial or complete dentures, contact your dentist today for a consultation.